The Cassini probe en route to Saturn has spotted two "shepherd" moons which keep one of the planet's rings in check through their gravitational influence. Prometheus and Pandora stabilise Saturn's narrow, ribbon-like F-ring. But the moons may have other, chaotic effects on the F-ring - their orbits become unpredictable when they approach each other very closely. Cassini will begin a four-year mission of exploration when it enters orbit around Saturn on 1 July 2004. It will release its piggybacked Huygens probe about six months later for descent through the thick atmosphere of Saturn's moon Titan. The two small, irregularly shaped shepherd moons exert a gravitational influence on particles that make up the F-ring. 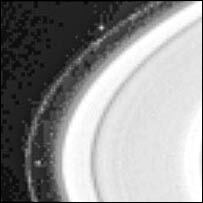 The outermost satellite, Pandora, which is about 84km (52 miles) across, keeps the F-ring from spreading away from Saturn. The innermost moon, Prometheus, which is about 102km (63 miles) across, prevents the F-ring from spreading towards the giant planet. However, the moons may also be responsible for features that sometimes form in the ring known as clumps and strands. The moons were discovered in images returned by the Voyager 1 spacecraft in 1980. One of the goals for the Cassini-Huygens mission is to get more accurate data on the moons' orbits. Monitoring how their orbits change over the course of the probe's mission will help Cassini determine the moons' masses. This will help scientists learn more about Prometheus and Pandora and give a more complete understanding of their effects on the planet's rings. The image was taken when Cassini was 55.5 million km (34.5 million miles) from Saturn. Cassini-Huygens is a cooperative project of the US space agency (Nasa), the European Space Agency (Esa) and the Italian Space Agency.